Many people enjoy showing their dogs as it is a great opportunity not only to show off your dog but to meet friends old and new. At classes we help to show you the best way to handle and present your dog in the show ring. The breeder of your dog will almost certainly also be able to help you get started and being a member of your breed club will offer you access to further show information. There are different types of shows. A local village show, often called a Companion Show, is one where you can turn up and enter on the day. They are held in aid of charity and are licensed by the Kennel Club. They tend to be advertised in local papers. The next level up are Open Shows and there are a considerable number of these held all over the country. 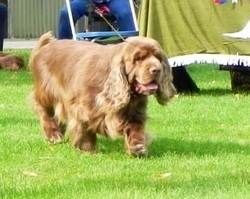 Local canine societies generally hold one or two shows per year and these are open to all breeds. They must be entered in advance. The highest level is a Championship Show. At these, with the right placings, you can qualify your dog to compete at Crufts and if you are successful enough at Championship Shows, your dog will become a Show Champion. If you do decide to show your dog, we wish you all the very best of luck. Remember, whatever the judge thinks, you always take the best dog home with you. Ringcraft is a great opportunity to meet other local dogs owners and exhibitors in a relaxed, informal and non-competitive environment. We have lots of fun and everyone loves to socialise, especially the dogs! Refreshments are available at each training session. Dog papers and show schedules are made available at each class for members to make use of. We will occasionally run matches, which will be notified in advance with a guest judge. Members can also compete for the Ringcraft Annual Awards: see our Awards and Trophies page for full details.